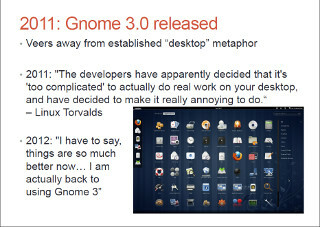 This talk was designed to open the minds of my Linux peers and get them to consider trying the Gnome 3.x user interface. 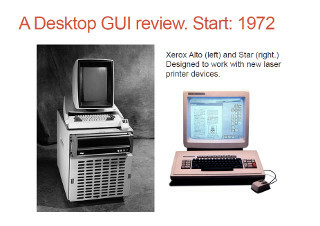 Personal computers have been using variations of the classic "desktop" user interface with little changes for over 15 years. Gnome 3.x with GnomeShell is a radically designed user experience that in my opinion offers simplcity and power in a beautiful form. Act 1: My story of falling in love with Unix workstations in the 1990s and how I've been chasing the fantasy of the perfect workstation user experience since. Act 2: A brief history of desktop user interfaces with an emphasis on how little we've changed since 1995. Act 3: A live show-and-tell demo using Gnome 3 with plenty of time for requests and questions. 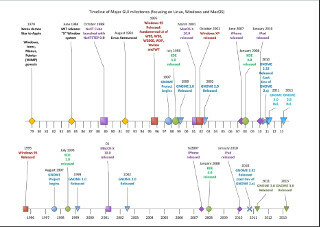 The slides here were used in Act 1 and 2. Unfortunately, a lot of improvised verbal narration presented in person is not included in the slides.